If you, your loved one or a parent is a veteran with wartime service or the unmarried surviving spouse of a wartime veteran, he or she may qualify to receive a VA pension that pays up to 60% of senior retirement community expenses including rental fees and care. Find out how to receive these benefits by filing claims with accurate information. 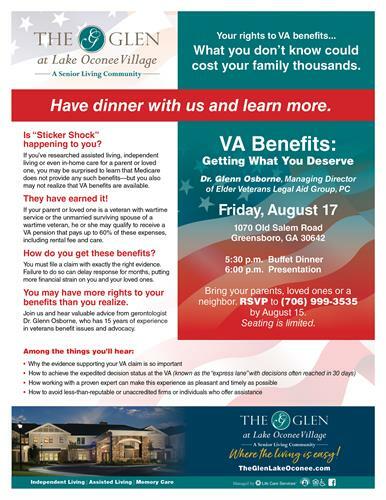 Join us to hear Dr. Glenn Osborne, with Elder Veterans Legal Aid Group, P.C. discuss this important issue. Dr. Osborne has fifteen years experience in veterans benefits and advocacy. Please RSVP so we can prepare for a dinner at 5:30 p.m. and the presentation at 6:00 p.m.